Quarter sawn oak cabinet. The #20 arm with mouthpiece is marked "Kellogg Chicago USA" and the wood is stamped "2816" under the base platform. Five bar generator (magneto) inside. 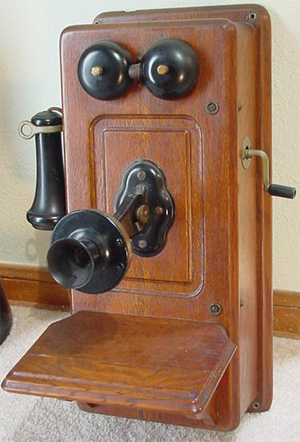 From the 1903 Kellogg Catalog: "This instrument is our standard bridging telephone for heavily loaded farmers' or toll lines, and is especially recommended for use on lines where over 15 instruments will be installed. 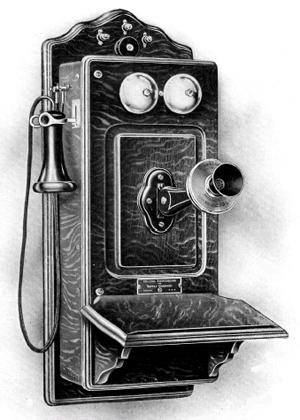 It is built on the same general lines as our standard compact type telephone, but the cabinet is made somewhat larger to accomodate a five-bar generator... 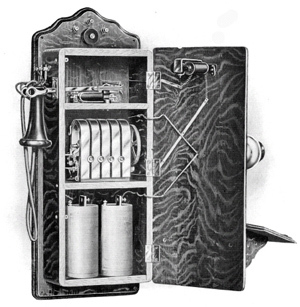 The talking circuit contains a standard Kellogg transmitter, receiver, and induction coil, the whole being especially adapted to operate with highest efficiency on the longest distance lines with two cells of dry battery."